Have you considered goats for your homestead? Goats are especially suitable to the prepper lifestyle as they provide meat and milk, eat comparatively less feed than other livestock, need less space, and will eat just about anything. If you have a small homestead or aren’t quite sure you have enough room for two goats (yes, you’ll need a minimum of two because goats are herd animals), you may be glad to hear that goats come in two sizes: standard and dwarf. Standard breeds aren’t that big, but they need some room. According to Raising Goats for Dummies, which I’ve found to be fairly accurate, if you live in an area where space is scarce, your goats will need a minimum of 20 square feet of sleeping/resting space and another 30 square feet for exercise. That size drops quite a bit when it comes to dwarf goats. You’ll need about 6 square feet of sleeping space and another 20 square feet for exercise. The sleeping space doesn’t need to be fancy — a lean-to, dog house, or three-sided shelter is great for them. Whatever you do, you do need good fences to keep your goats in and away from your garden, otherwise they’ll ravage your crop. Having a good electric wire with 1 joule or more of power is a great deterrent. Be sure your fence is at least four feet high and not climbable; otherwise, your goats will be everywhere. I got one of my goats in trade for four chickens from a woman whose doe was constantly pushing through a stock fence with six by six openings. Putting her in a chain-linked fenced area made a difference. Unfortunately if you’re looking for a goat that provides meat and milk you’re probably going to get a goat that doesn’t do either very well. That’s why there are meat and milk goat breeds. Of all the standard-sized dairy breeds, the one I recommend you stay clear of is the Toggenburg because certain lines tend to have strong tasting milk that most people dislike. Standard breed does (the name for female goats) normally produce between a quart to a gallon of milk a day. My own does normally produce about a half gallon to three quarters gallon a day per does in full production from once a day milking. I could get more milk if I milked twice daily, but I have to weigh the time it takes to milk versus payoff. Dwarfs of the larger breeds tend to be the larger breed crossed with a Nigerian Dwarf to get the smaller size. I have two smaller does that typically produce about a pint to a quart of milk a day. So, if you can live with a quart to half gallon of milk once a day, two dwarf does may be enough. People are often leery about goat’s milk when they shouldn’t be. If you taste store-bought milk, you’ll find it tastes different than fresh goat’s milk because it’s often ultra pasteurized and has been on the shelf longer than goat’s milk should. Goat’s milk goes bad quickly. If you taste fresh goat’s milk, it tastes a lot like cow’s milk, only richer and a bit sweeter. It actually has more calcium and many other nutrients than cow’s milk. One thing to keep in mind is that you will have to breed your does to a buck (male goat) in order to produce a kid and thereby have milk. Bucks are a pain because of their mating habits (they pee on their beards and legs because the stench entices does and stimulates ovulation), so if you can use someone else’s buck to breed your does, you may want to do so. These goats can get quite hefty. Boer goats are capable of getting between 200 and 300 pounds. Goat meat is very lean and tastes quite a lot like very lean beef, if prepared correctly. One word of caution: if you plan on slaughtering bucks, be sure that you wether or castrate them first and give them time to work the testosterone out of the meat before slaughtering (a month or more). Otherwise, you may get meat that is nearly inedible. Goats will live on whatever forage they can get. They will eat table scraps, pieces of fruits & veggies that no ones wants, grass and even poison ivy. They’ll need minerals to stay healthy, and maybe a little grain when they’re producing milk, but beyond that, they’re pretty self-sustaining. You will probably have to feed them with hay or other feed during the winter months. 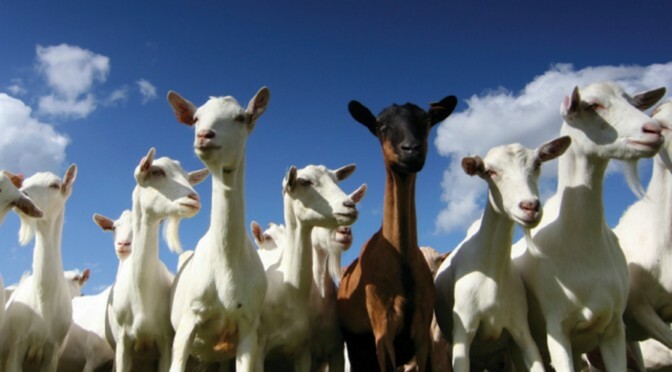 When it comes to livestock from a preparedness mindset, goats are about as good as it gets. They make great milk, their meat tastes great (when prepared properly) and they will eat just about anything. You can get started with goats very cheaply, on little land, and little training. How long does it take for a meat goat to get to full size? Pound for pound, goats vs cows, goats are a great source of both meat and milk. The statement that “Unfortunately if you’re looking for a goat that provides meat and milk you’re probably going to get a goat that doesn’t do either very well. ” is one that I respectfully disagree with. I have maintained a dairy herd for many years. Most of my goats are purebred Saanens and LaManchas. I also have a couple of Swiss breeds in the mix. LaManchas are really excellent for meat after whethering (castrating the males) and very good milkers. The best of both worlds in my opinion, is to crossbreed LaManchas and Saanens. It gives you size, growth rate, good milk and meat. It also lends hybrid vigor. If you can defend your herd, you will have an incredible bartering product as well as home use. Like Russel, I too make butterand cheese. I also make cream cheese, yogurt, cottage cheese, sour cream- OK- all things dairy from my goat milk. The meat is wonderful for jerky as well as roasting. Goats can and will browse nearly everything, but if you want good production, you will need grain or excellent pastures that produce grain grasses. I would also keep Diatomaceous Earth on hand for worming, as well as loose minerals and baking soda. Do not buy grains made for cows for them- it will kill them. It has been so many years now since I have had to think about it, but I believe it is the urea that is in grain for cows that is the issue. If you are considering goats, PLEASE read a lot about them first. I hope this info helps somebody.